In November 1974, Werner Herzog received word of the imminent death of film historian Lotte Eisner. He resolved to walk from Munich to be at her side in Paris, in the faith that by essaying this trek, "our Eisner mustn't die, she will not die, I won't permit it"; furthermore, that "when I'm in Paris she will be alive. She must not die. Later, perhaps, when we allow it". The journal he kept of his peregrination through rain, sleet, hail, and snow is a dizzying document. Despite frequent reference to trains and cars, the feeling is that of a journey which may have been made at any time over the past 500 years, as Herzog alternates ecstatic visions (including the ending of Stroszek) with querelous complaints about the state of his feet, legs, and groin. In late November 1974, filmmaker Werner Herzog received a phone call from Paris delivering some terrible news. German film historian, mentor, and close friend Lotte Eisner was seriously ill and dying. Herzog was determined to prevent this and believed that an act of walking would keep Eisner from death. He took a jacket, a compass, and a duffel bag of the barest essentials, and wearing a pair of new boots, set off on a three-week pilgrimage from Munich to Paris through the deep chill and snowstorms of winter. 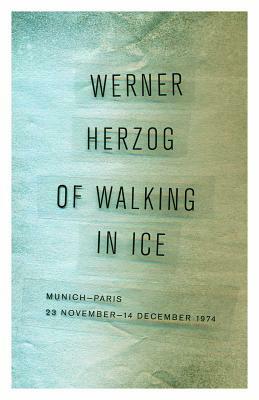 Of Walking in Ice is Herzog’s beautifully written, much-admired, yet often-overlooked diary account of that journey. Herzog documents everything he saw and felt on his quest to his friend’s bedside, from poetic descriptions of the frozen landscape and harsh weather conditions to the necessity of finding shelter in vacant or abandoned houses and the intense loneliness of his solo excursion. Werner Herzog has produced, written, and directed more than fifty films, including Nosferatu the Vampyre; Aguirre, the Wrath of God; Fitzcarraldo; and Grizzly Man. He grew up in a remote mountain village in Bavaria and now lives in Los Angeles, California.